Many riders pass the junction of the Pig Trail (Ark 23) and Ark. 215, "wowed" by what they have just experienced on the legendary Arkansas riding icon . But little do they realize what they are passing up by riding by the innocent appearing Ark. 215 taking off to the east. In the photos to the left and below, my riding buddy, Jimmy, and I stop for a water break just after finishing The Pig Trail and before taking the "215 to Oark". Ark. 215 winds along beside a popular white water float stream, the Mulberry River. This tricky, mid-category river has claimed many a canoe and kayak, even when piloted by experienced paddlers. 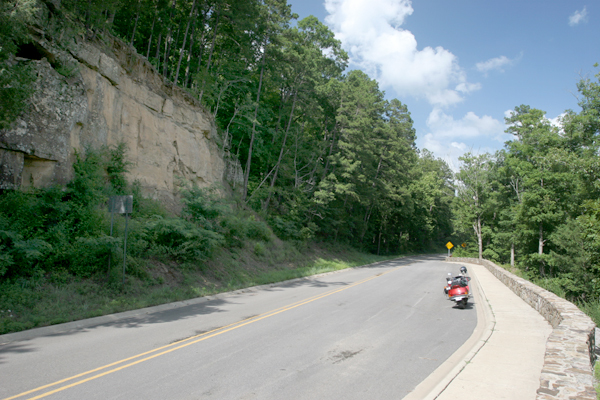 The highway provides glimpses of the river through the heavily forested Ozark National Forest. And the trees often totally enclosed the road making a tunnel of foliage. About half of the highway has been nicely improved. Right now, there is a two-mile stretch where the chip-and-seal pavement is being taken up in preparation for the improved road. Take it slow. 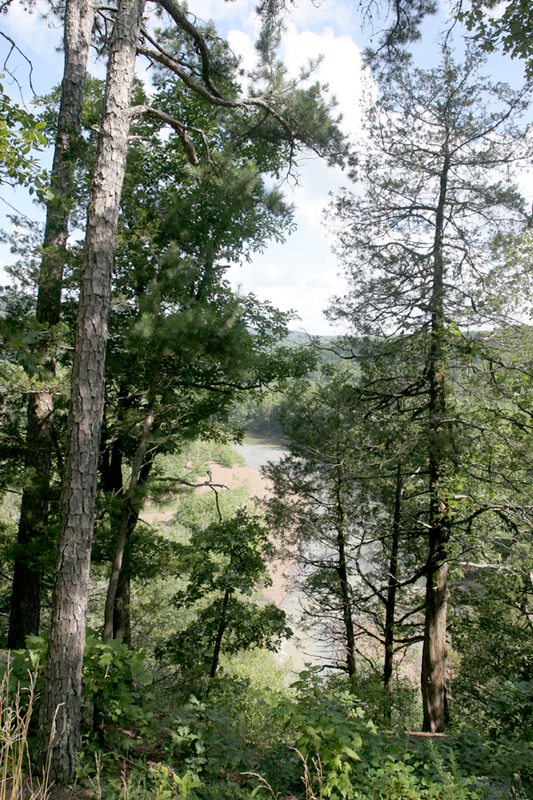 The photos at left show the river through the trees and one of the pull-offs along the way. The road is pretty narrow, but the improvements have made it very nice regardless. In fact, it being narrow gives it a real "boon-docks" feel. Ark. 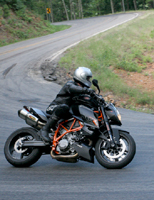 215 is a real serpentine cruising road. 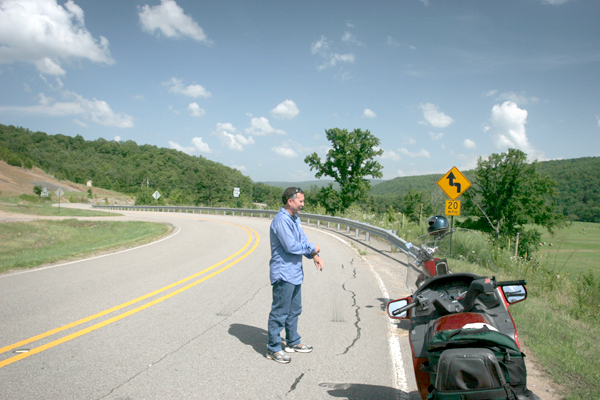 Once in Oark, a 16-mile ride, you realize that you are really in the middle of nowhere - except "nowhere" is in the middle of some of the best riding in the Ozarks. 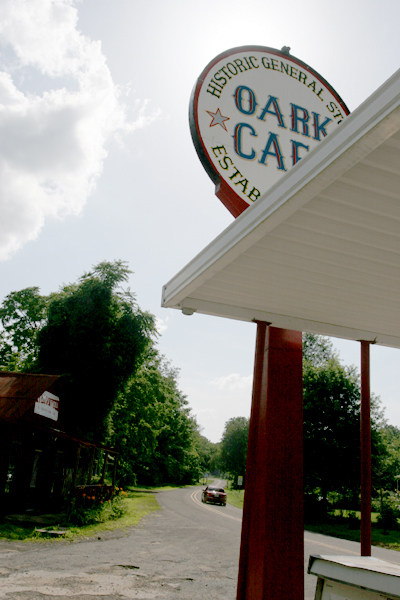 But Oark is home to a very interesting business.. the Oark General Store and Cafe. 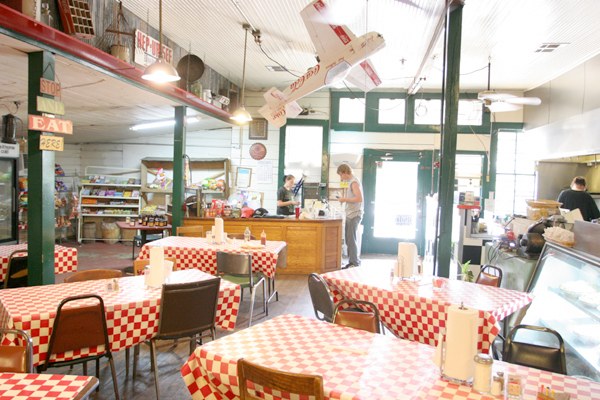 The store was established in 1890 and is thought to be the oldest continually operated general store in the country. 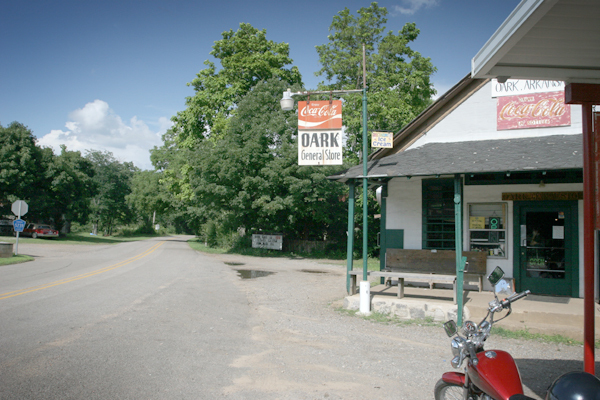 But the riding fun is just beginning when you finish your lunch or break at the Ozark General Store. If you backtrack from Oark about a mile, you will come to Ark. 103. When you do, TAKE IT!!!! 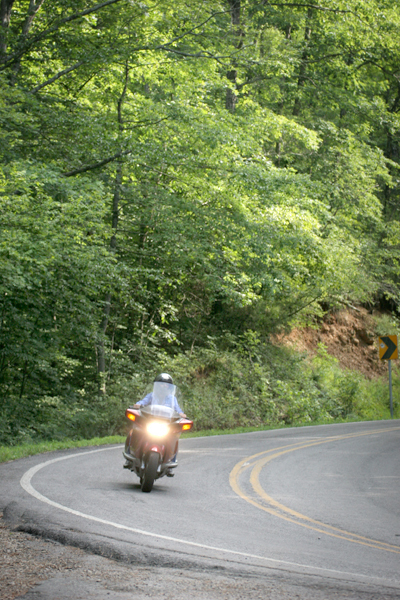 Waiting for you on the 19-mile ride will be a real roller coaster ride through heavy forest. The highway travels up and over the mountains as it makes its head-long dash for the Arkansas River Valley at Clarksville. If Ark 215 were a white water river, it would be a Category 3. 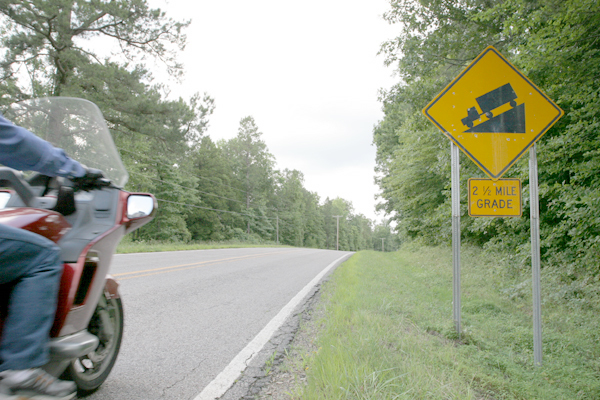 Ark 103 would be a Category 4, with a Category 5 or 6 designation where the twin 180 hairpins make their tight, knee-dragging presence known. Even when Ark. 103 flattens out as it descends to the foothills, the thick forest continues to make the ride very scenic. 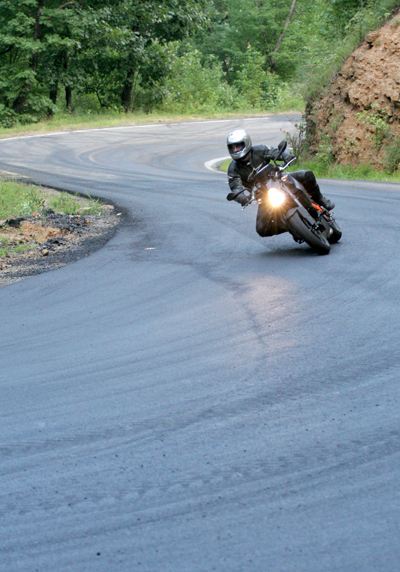 Terry Skogen from Carbondale, Col. carves some of the hairpins on Ark. 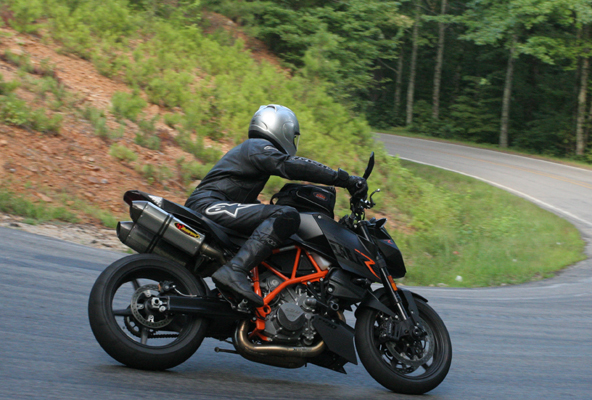 103 on his KTM 990 Super Duke R. The ride covered stretches of Ark. 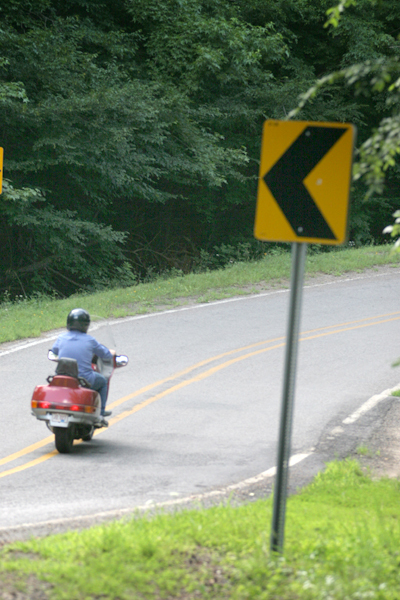 highways 21, 23 (the Pig Trail), 103 and 215. Each has its own personality and high points. You really need to give this loop a try. 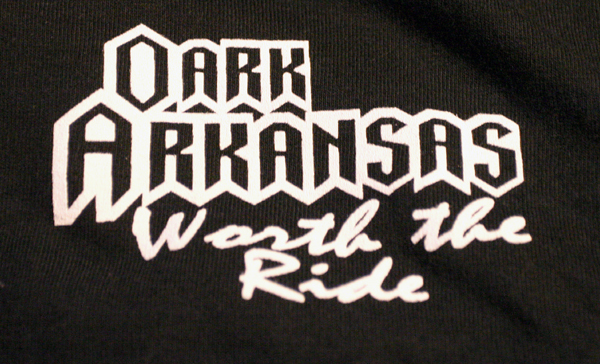 The Oark General Store t-shirt says it all! Click hereto see the Western Map. You've just got to check out this route. It should not be missed... PERIOD!!!!! !